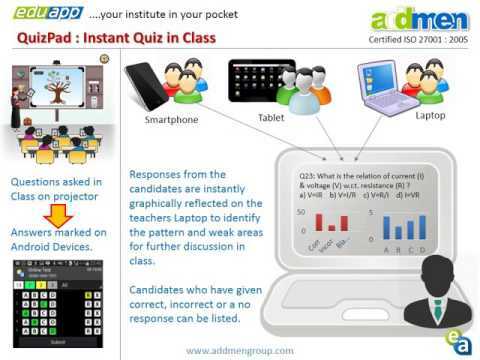 Addmen Android EduAPPlet is an institute management software which is privately labelled. This means that it can be customized to show your institution name, branding, colors etc. It is developed for android based smartphones and tablets and has the capability to handle all the aspects of institution management. The variety of facilities like Attendance, Click Pix, Course Monitor etc. reduces work load of the institute by providing selective entry interfaces to teachers and students as and when required. It is the right software for institutions needing an affordable yet complete management solutions. Institute upload videos with ease at no cost. Students get restricted access to free or purchased videos. Restricted access with no possibility of copying or password sharing. The two prevalent methods i.e. CD and Online Account have their limitations. In case of CDs, the institute needs high volumes to get the CDs copy protected at an economical cost, so it is really difficult for startups. In case of online Accounts, password sharing cannot be stopped. With Eduapplet, the institute can reach out and stay connected all time to all its members whether student or staff. And so with this the information gap is also minimized. It is now very convenient to get quick feedbacks and opinion polls without planning any specific event. No need of OMR sheets. No need of Computer labs for taking online feedbacks. With the increased flexibility, reach and ease of operation you can quickly take surveys on anything and everything. Many ready to use feedback questionnaires are already available on the App like: Faculty Feedback, Institute Feedback, Hostel & Campus Feedback, Training Program Feedback etc. Teachers not covering all the topics in class or not giving balanced time and focus to all the chapters in the syllabus has always been an agenda of the issues raised by students. On the other hand, in case of multi branch or a multi class institute where there are different teachers teaching the same syllabus in their own order and pace, it is always difficult for the institute to judge whether all classes are at the same level of course completion and whether it is the right time to have a common exam. This feature leaves no scope for information gap. The students and the institute management will stay updated with everyday course progress in the class. The teacher follows a preset academic plan and update the chapter and topic covered in each class as he marks the daily attendance, thus minimizing the chances of students making wrong complaints and teachers not giving proper time to certain chapters. Teachers & Students carry the updated Weekly class schedule in your pocket. Search and reserve Books online. No need to go to the library to search for books. Get notifications on your device as soon as the reserved book is available in the library. Get notified and reminded for return dates and fines.